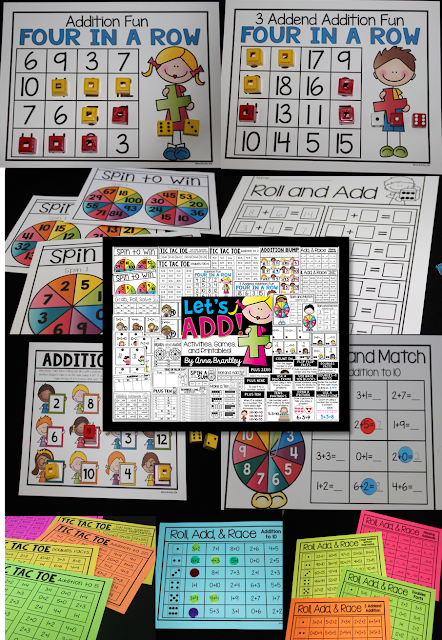 A couple of years ago, I started using digital/paperless Number Talks during my guided math block. 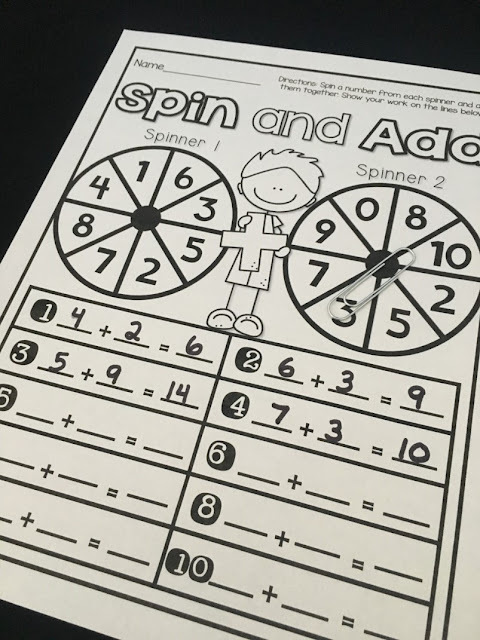 The results from this simple, powerful teaching practice blew me away. They instantly became the perfect math warm-up! 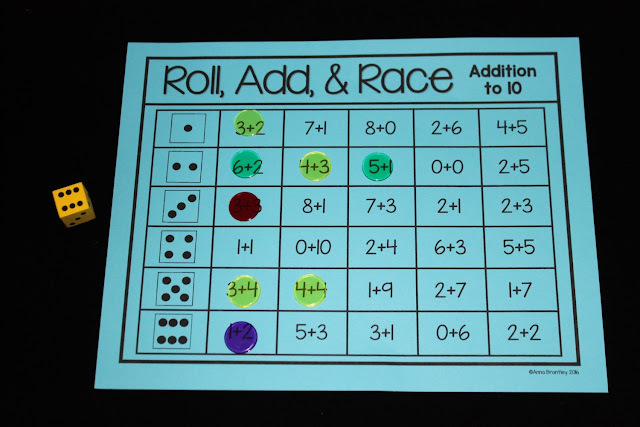 My students were engaged in meaningful discussions focused on mental math and computational strategies. 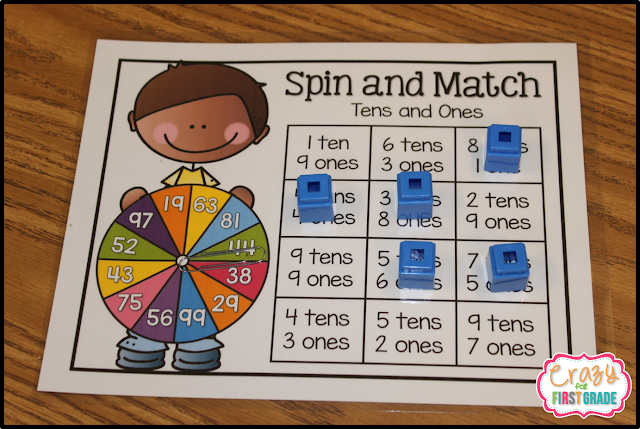 They were building their understanding of number sense and flexibility in number thinking. 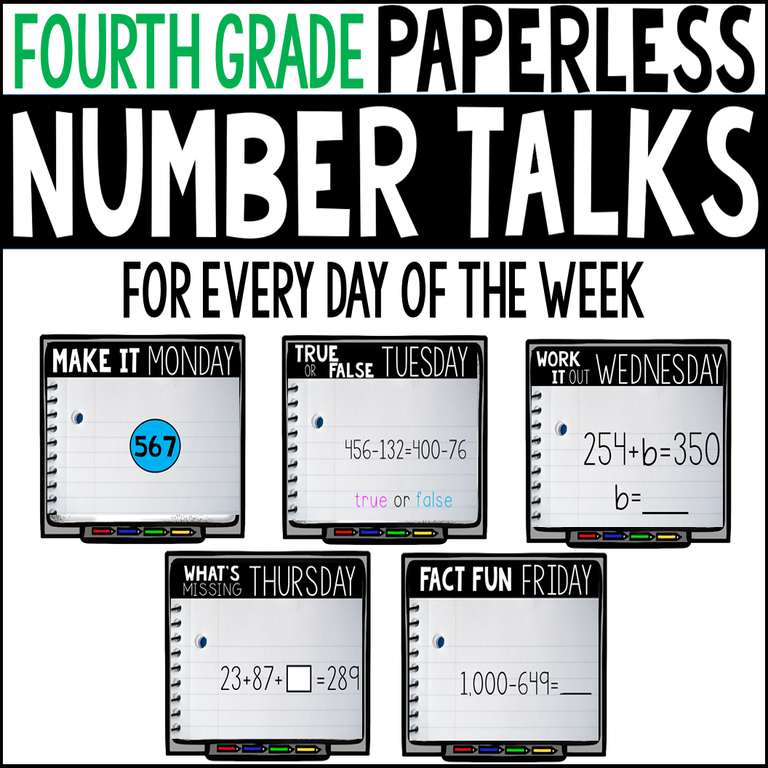 The benefits of this daily (5-10 minutes) Number Talk routine was also evident throughout the rest of our math time. To make Number Talks effective for my students, as well as for me, I started carefully crafting problems into digital slides each week. It didn't take long for me to realize that digital Number Talks are AMAZING! 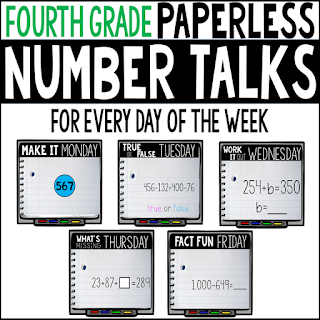 All I had to do each day was open up a slideshow and my Number Talk lesson was ready. Such a time saver! 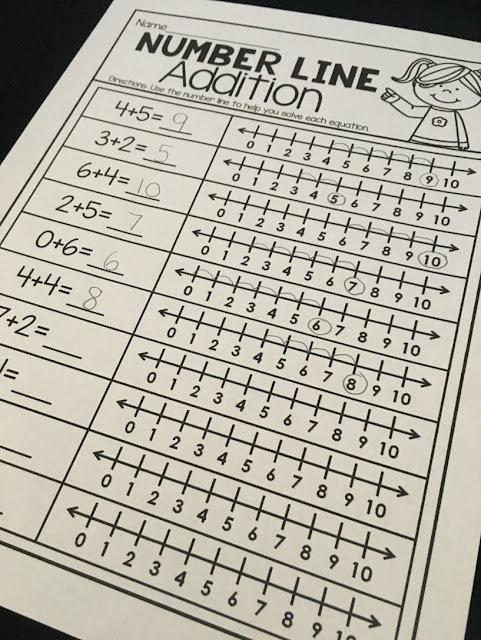 Since Number Talks are all about the process of mental math computation and sharing strategies, the digital/paperless format was perfection. 1. Teacher presents each problem and gives wait time. 2. 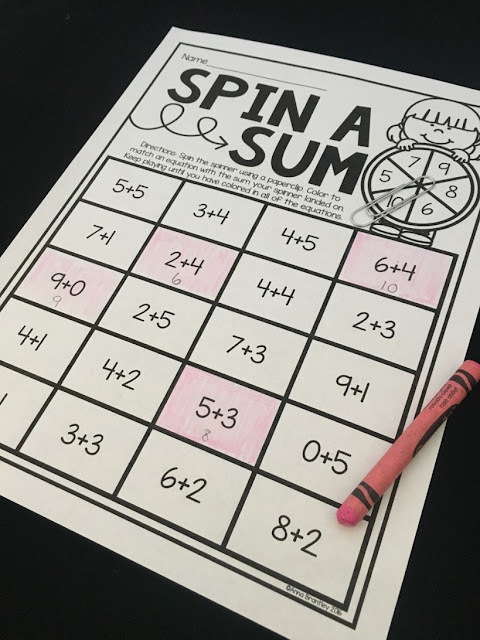 Students mentally figure out the answer (no paper or pencil) and give a thumbs up to show that they have at least one solution. 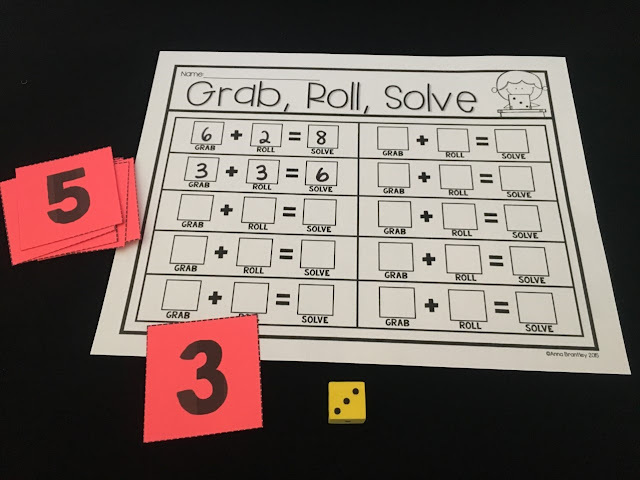 *Students can put additional fingers up if they have more than one way to solve the problem. Example: Two fingers up means I have two ways to solve the problem. 3. 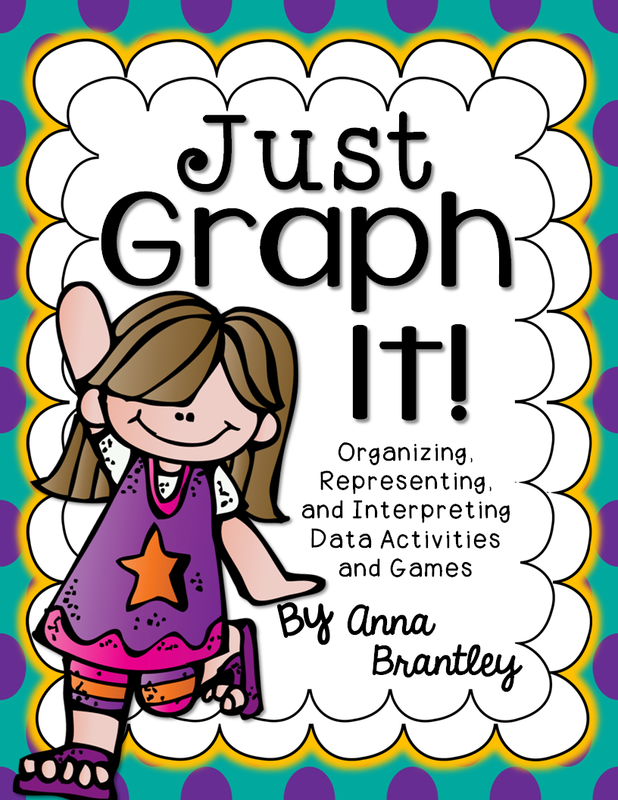 Students share their thinking as the teacher records (students can also record). During this time, the teacher is asking questions like: "How did you get your answer?" and/or "Why did you use that strategy?". Incorrect solutions and methods can and should be part of Number Talks. 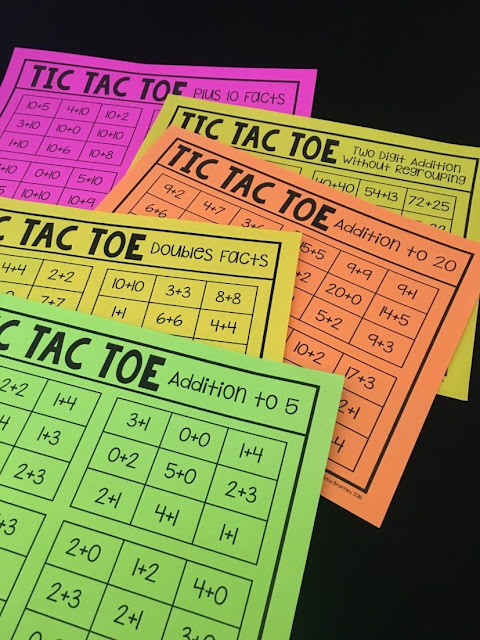 I personally like to do Number Talks at the beginning of my math block, but it can be done at any time that works best for your schedule. 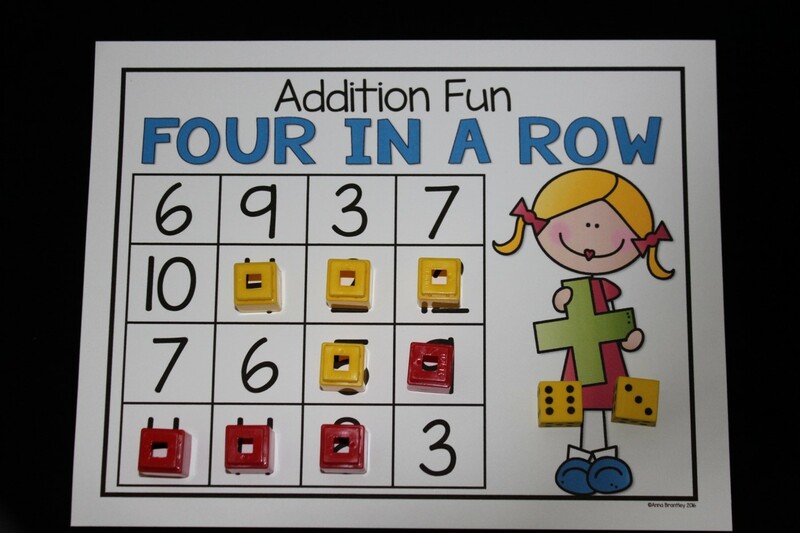 You can start Number Talks at any time of the year, and I've made it really EASY for you! 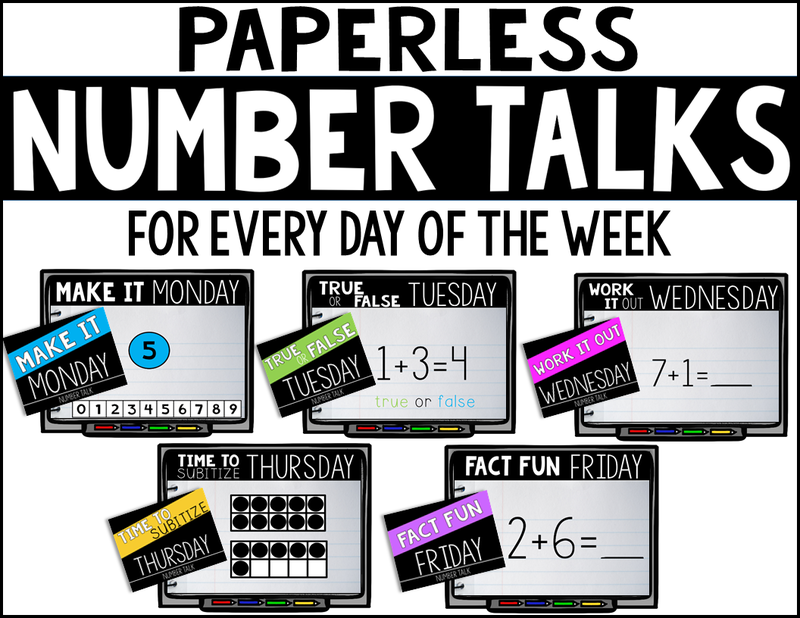 You can get 40 weeks of PAPERLESS NUMBER TALKS in just one click here! 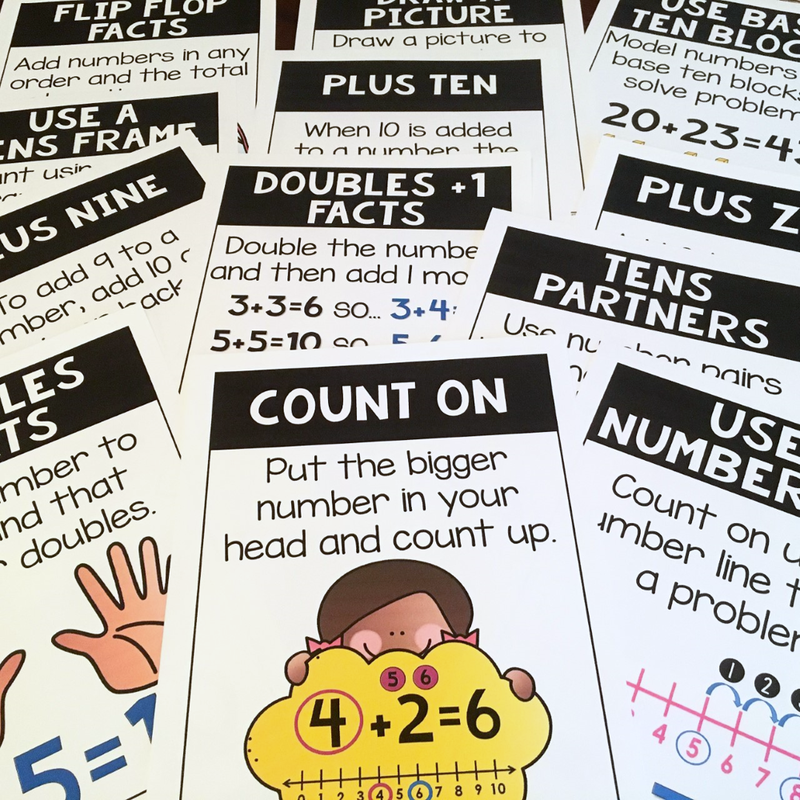 These Number Talk lessons were designed to engage your learners in meaningful math conversations focused on mental math and computational strategies throughout the year. 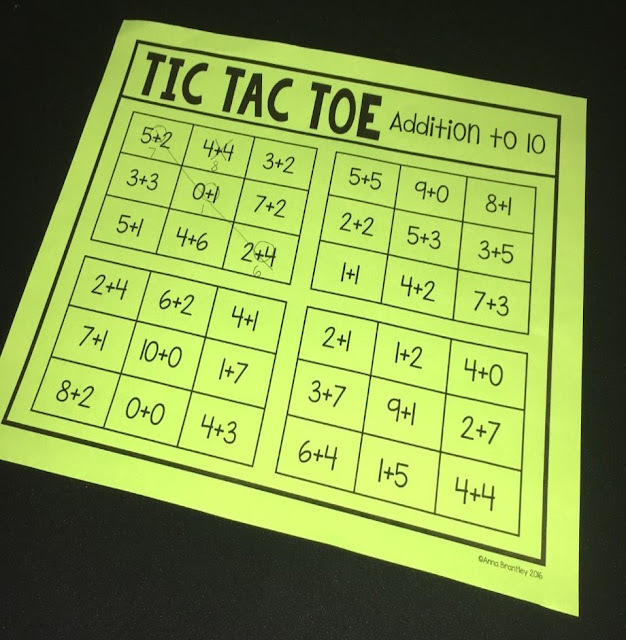 As I mentioned before, they make the perfect math warm-up! 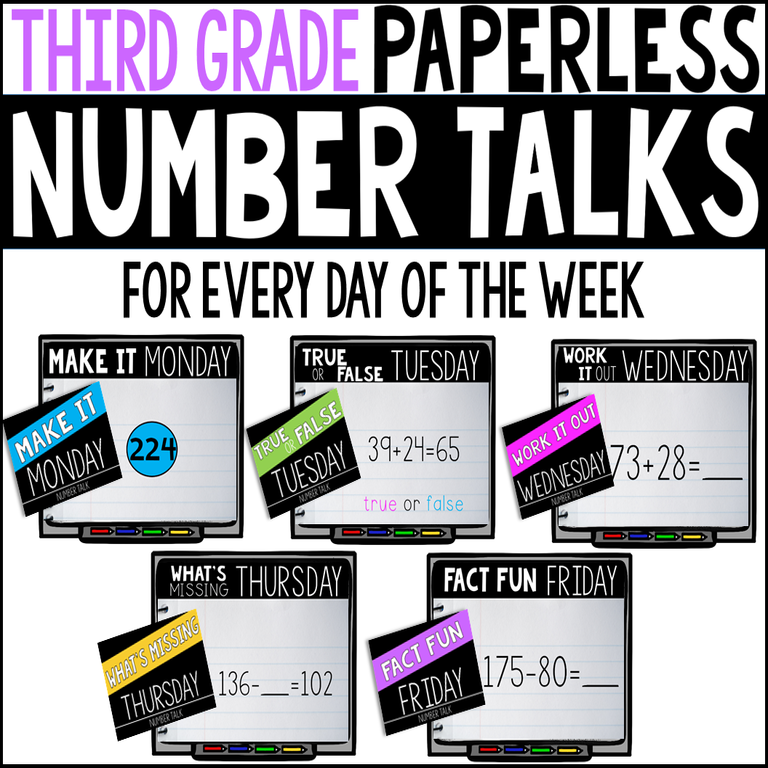 All you have to do is upload the Number Talk digital slides (PowerPoint)- PAPERLESS and ZERO prep! Everything is already done for you! 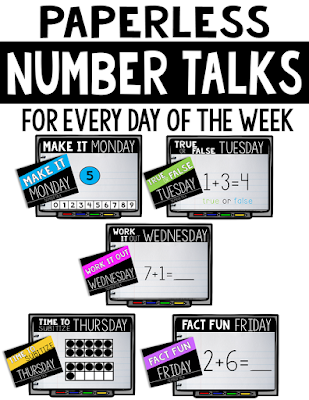 Each day of the week has a specific Number Talk mental math focus. The predictable and student friendly structure of the digital slides allows you to spend more time talking about math instead of giving directions/expectations over and over. 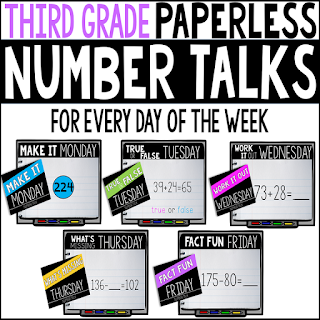 PAPERLESS Number Talks for 1st grade! whether they are true of false. 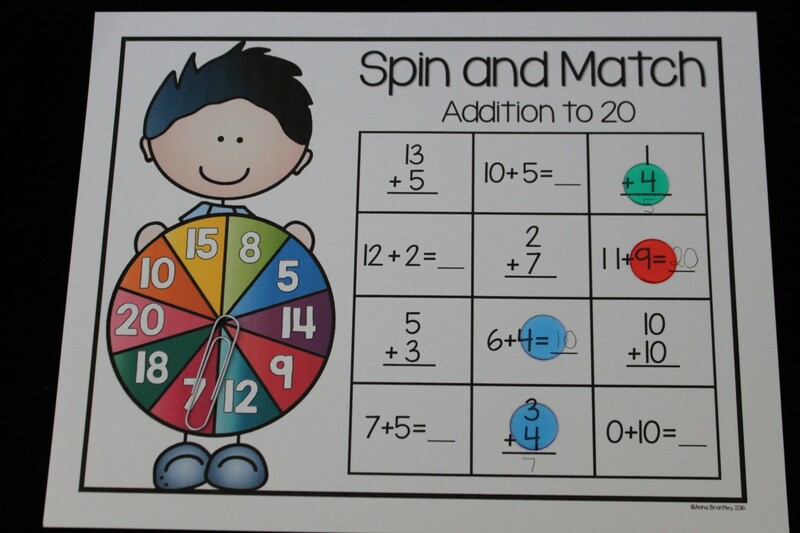 Students will mentally solve the equations and share their thinking. Briefly (5-10 seconds) flash each slide. Students will share what number was shown, as well as, explain their thinking in determining the number. 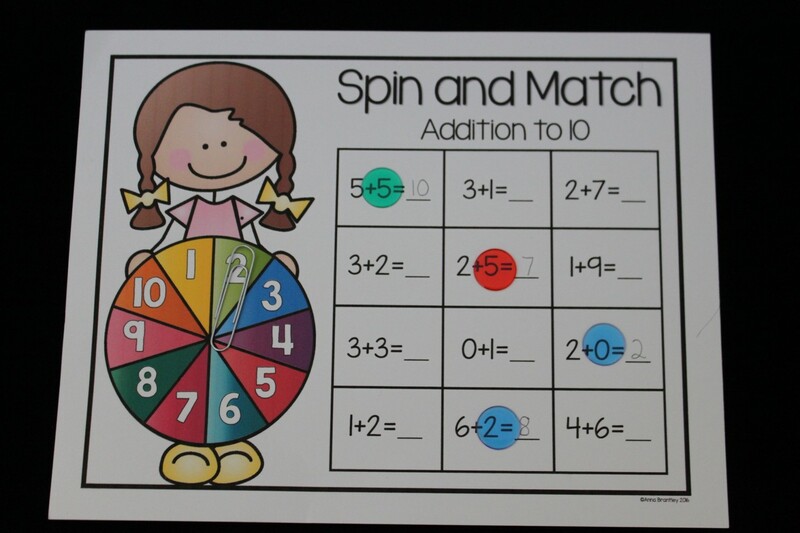 Every daily lesson has 5 slides/problems with the exception of Make it Monday where students are brainstorming ways to make the target number. I've also included editable/blank slides in case you would like to create your own problems. Number Talks have never been easier! Try a week for free here! 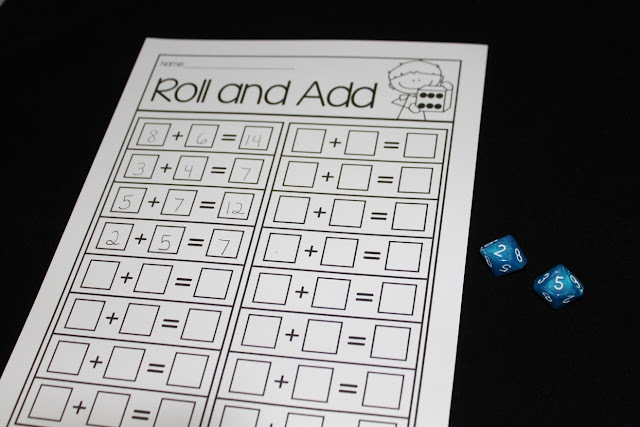 Addition Fluency Fun (with free I SPY Addition game)! I don't think first graders can ever have too much place value practice. 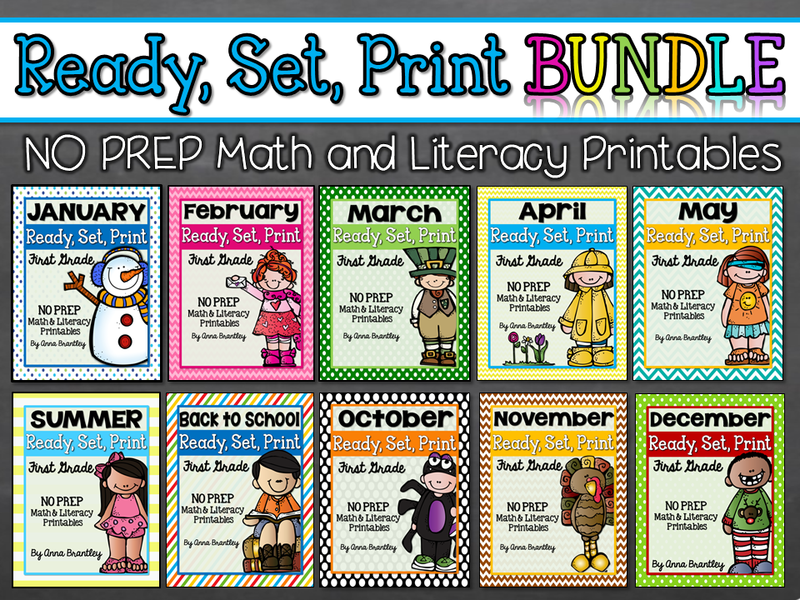 I pretty much start teaching it as soon as they walk through the door and we continue reviewing it all year long in as many different ways that I can think of and then some. 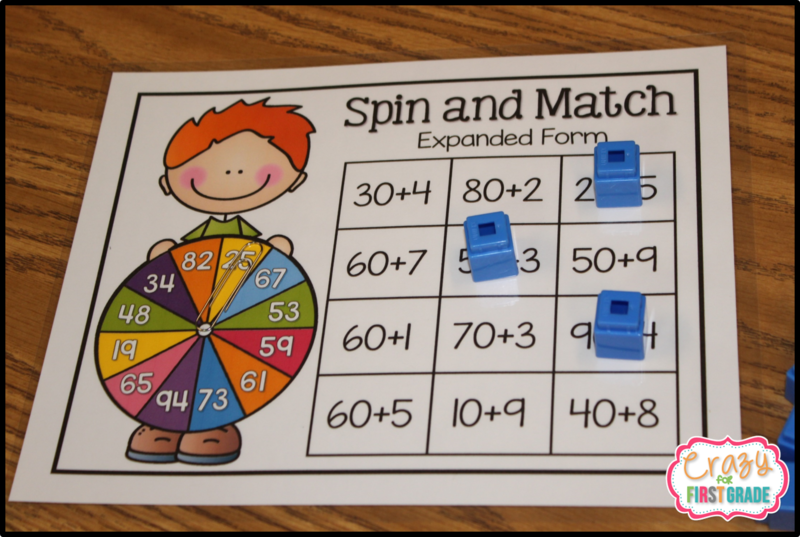 Spin and Match is an activity that can be played in groups of 2-4. 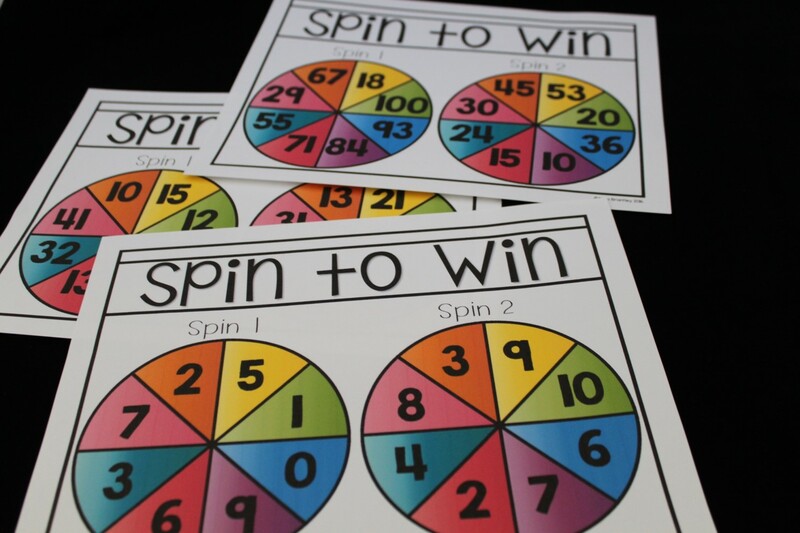 The players take turns spinning and matching the number representation on their board. The first player to cover all their spaces wins! 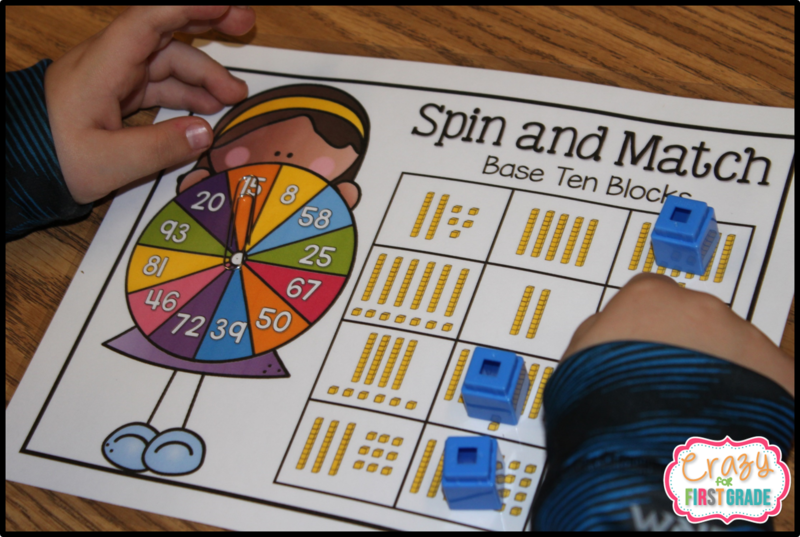 Three different game boards are included in the pack: base ten blocks, tens and ones, and expanded form. 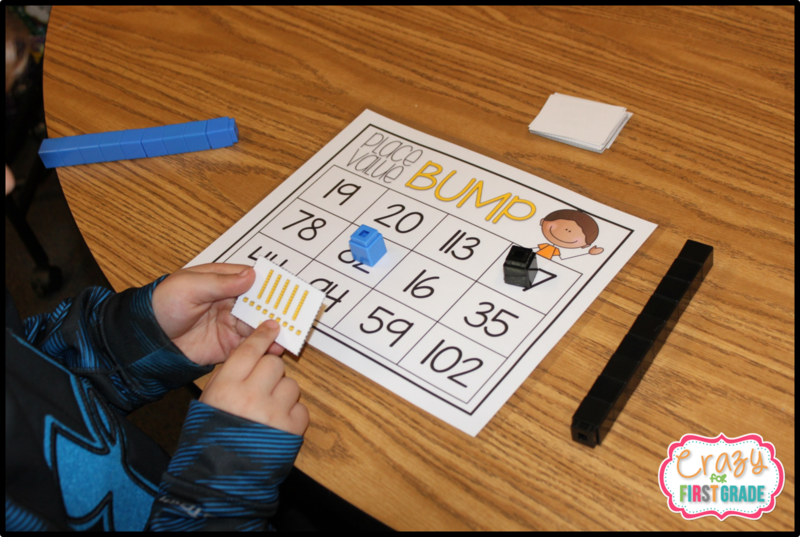 Place Value BUMP is such a fun game! 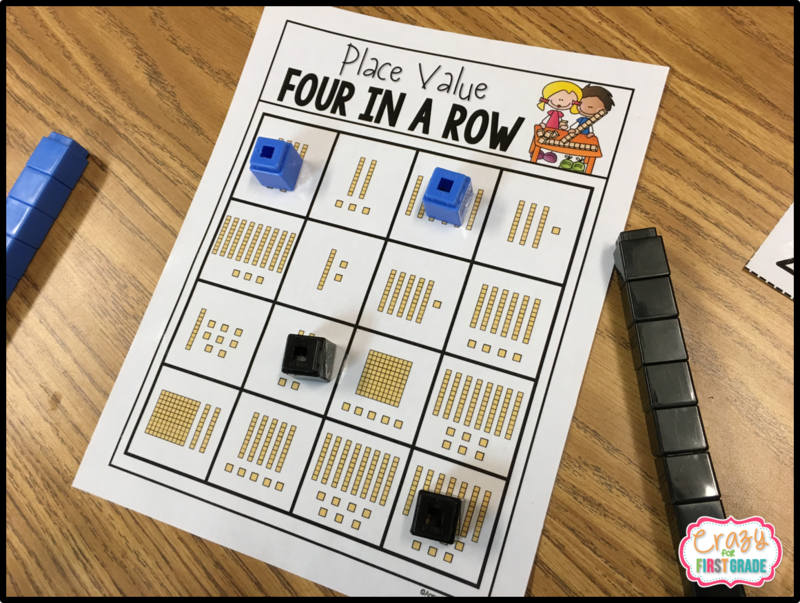 Partners take turns pulling a place value card from a bag and covering the correct number with a counter on their game board. If a number already has a counter on it, the other partner has a chance to "bump" it off. If a student gets the same number twice, then he /she can place two counters on it. If a number has 2 counters, it’s frozen and cannot be "bumped" off. The first player out of counters wins the game! 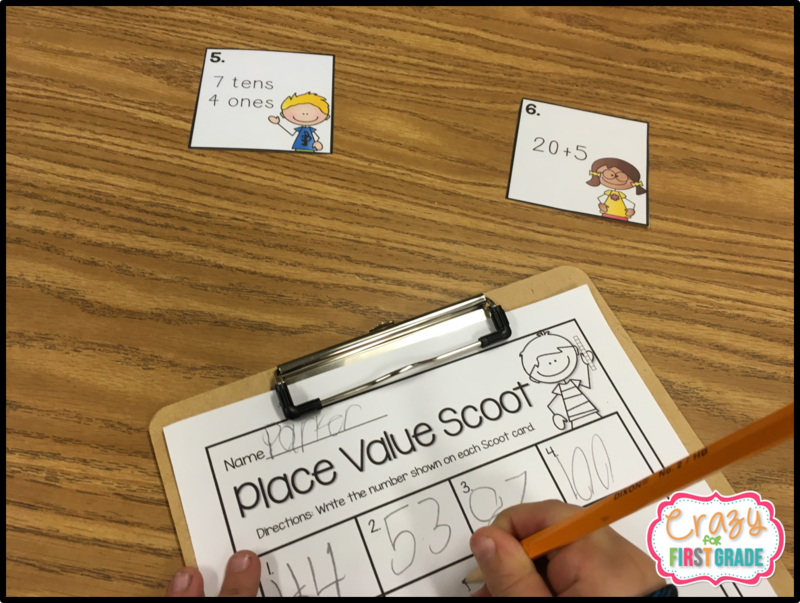 I love it when my students can move around and learn at the same time, which is why I'm a huge Scoot fan! Place Value Scoot is an activity where your students move around the room and write down the number shown on each Scoot card. The Scoot cards are a mix of base ten, expanded form, and tens/one review. 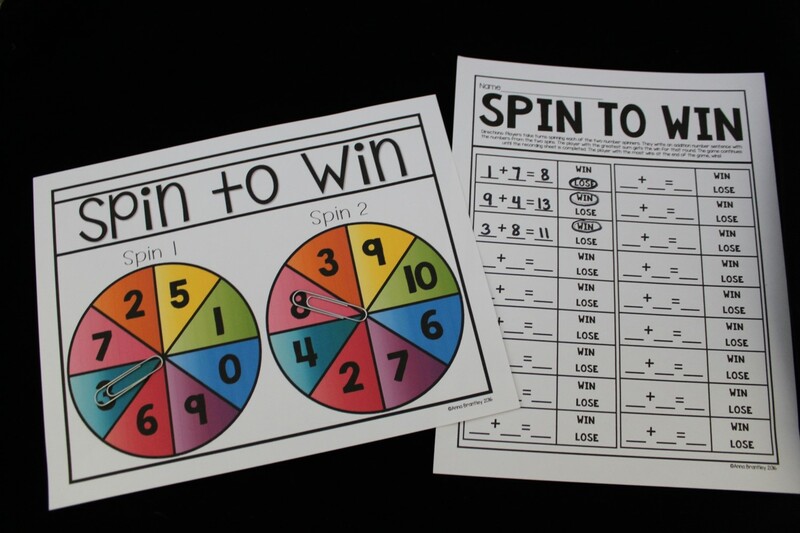 Brain break + math activity = Win-Win! 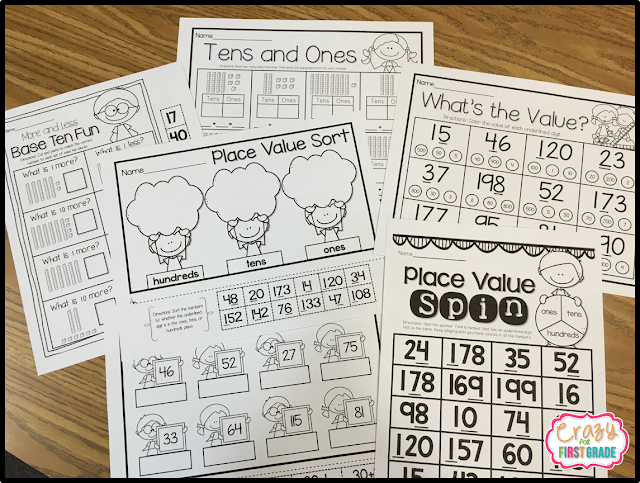 Place Value Bags is a great math tub or small group activity! 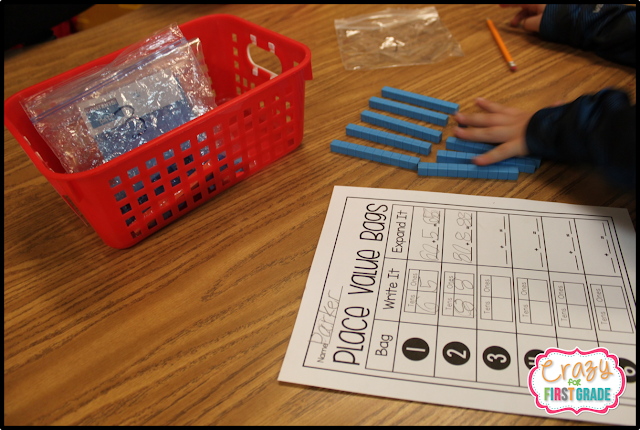 Students count the number of base ten blocks in each bag. Then they show how many tens and ones are in the number and write the expanded form on their recording sheet. 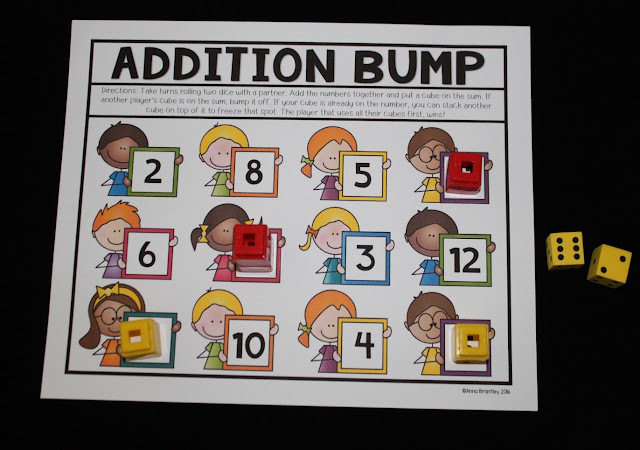 There are also several different Place Value Flap Books to give your students extra practice! Four in a Row is class favorite! 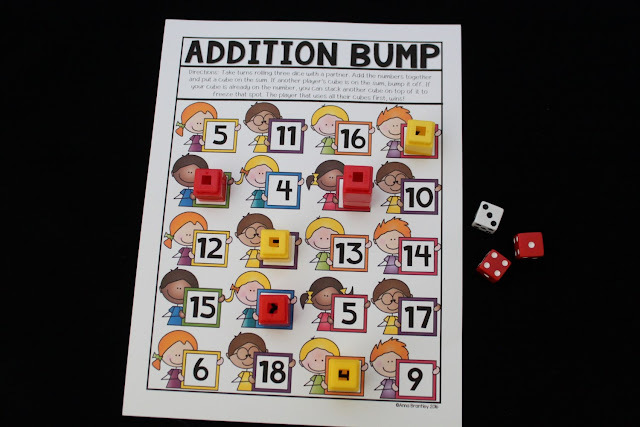 Players take turns picking a number card and covering the same amount on their board. 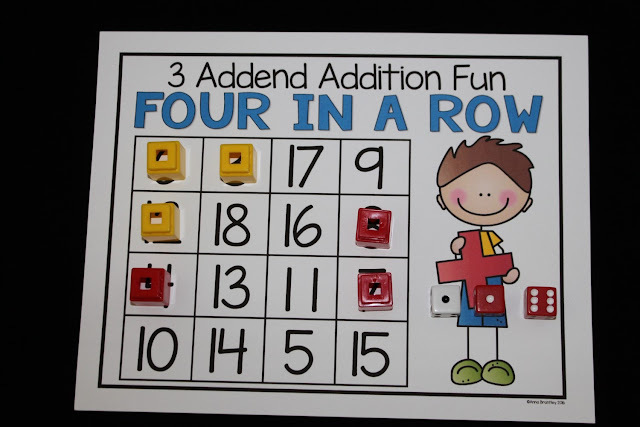 The first player to cover four sets of base ten blocks in a row wins! 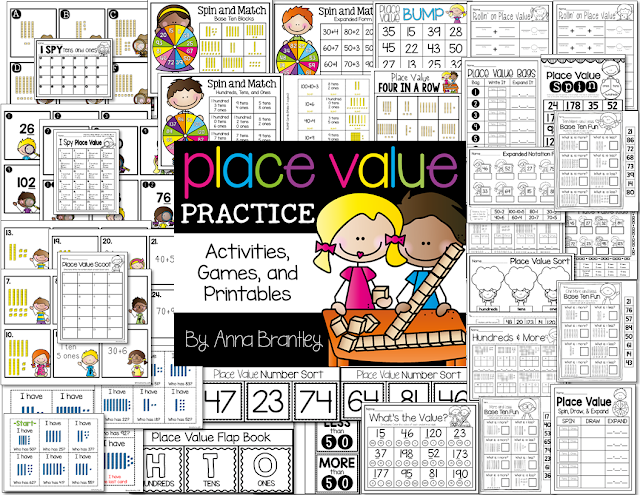 There are also a dozen different no-prep place value printables in my place value practice pack! 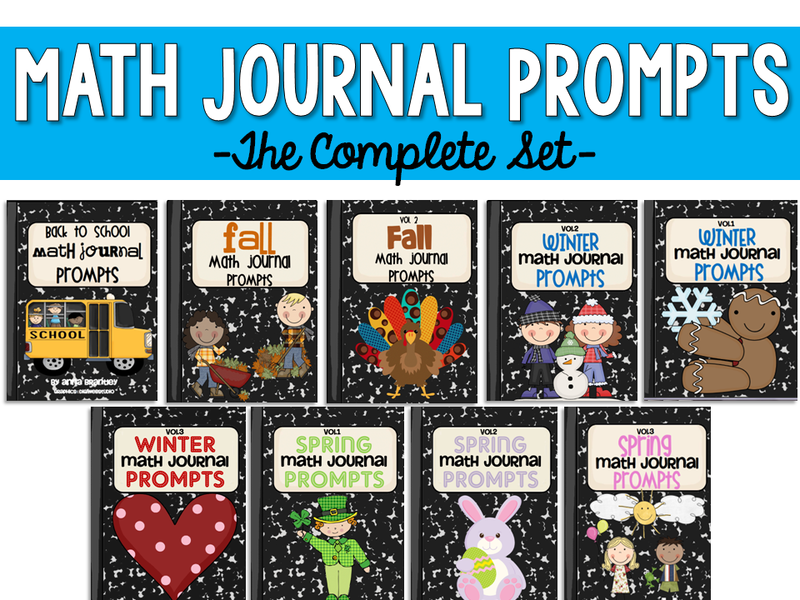 They are great for homework, morning work, math tubs, and sub plans! 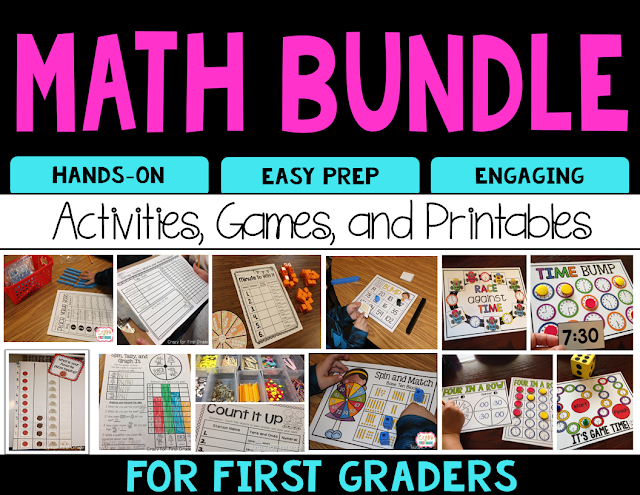 If you're looking for other math activities to add to your classroom, make sure to check out my math bundle! 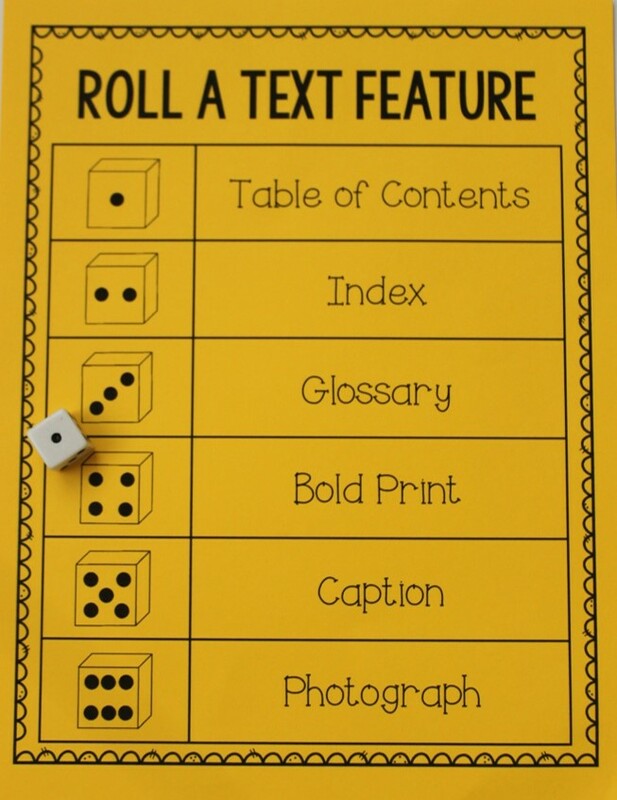 Teaching Nonfiction Text Features (Free Download Included! 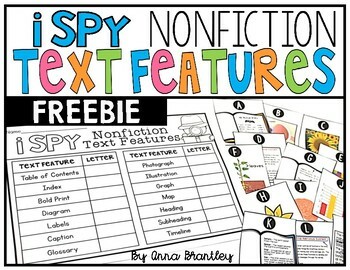 Teaching nonfiction fiction text features is important, but some of the resources out there can be so DRY for our little ones! 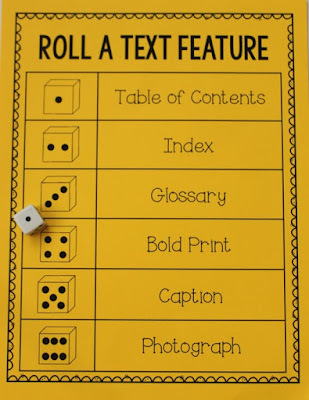 Last year, I was on a mission to create FUN, hands-on, and engaging resources to give my students more time to explore, identify, and understand nonfiction text features. 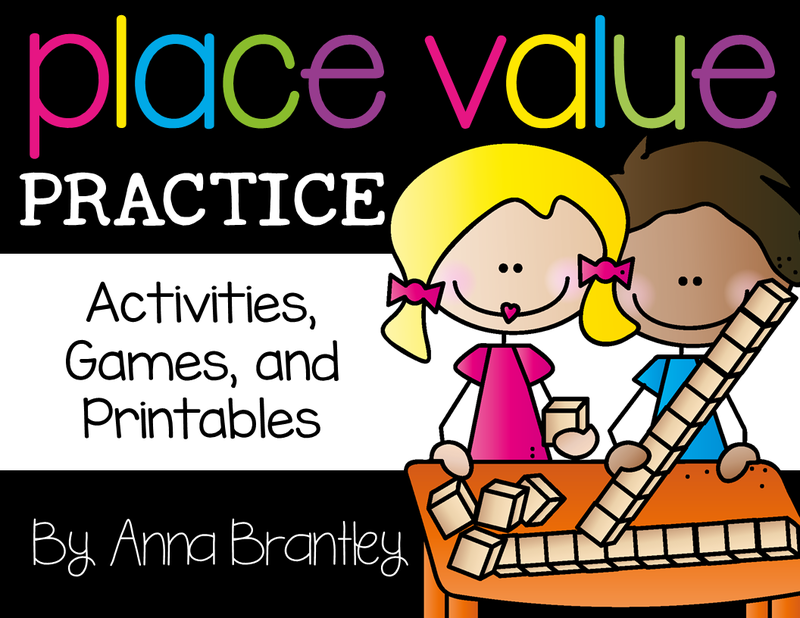 I'm so excited to share with you some of the activities and games that have brought this first grade standard to life in my classroom! 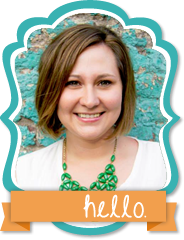 Click here to check them out! 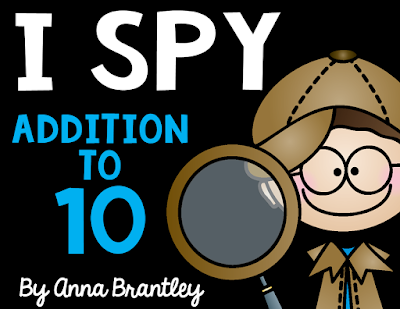 Grab I SPY NONFICTION TEXT FEATURES for FREE HERE! 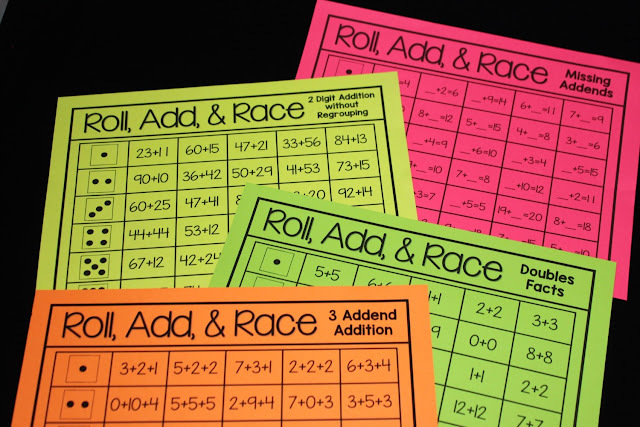 Want all of the games and activities? !